EMERGENCY: Real stories from Australia’s ED doctors gives the most compelling insight yet into the lives of real Australian emergency doctors, for the simple reason that it’s been written by them. Published by Penguin Australia in collaboration with the Australasian College for Emergency Medicine (ACEM), EMERGENCY: Real Stories from Australia’s ED Doctors is a collection of stories written by the men and women working in the intense and relentlessly demanding world of emergency medicine. This is a world where anything can happen, from catastrophic road trauma and acute drug-fuelled psychosis to cardiac arrest and domestic violence; emergency physicians have to deal with it all. Collected and edited by Dr Simon Judkins, the stories they tell are moving, shocking, heartbreaking and, at times, humorous. 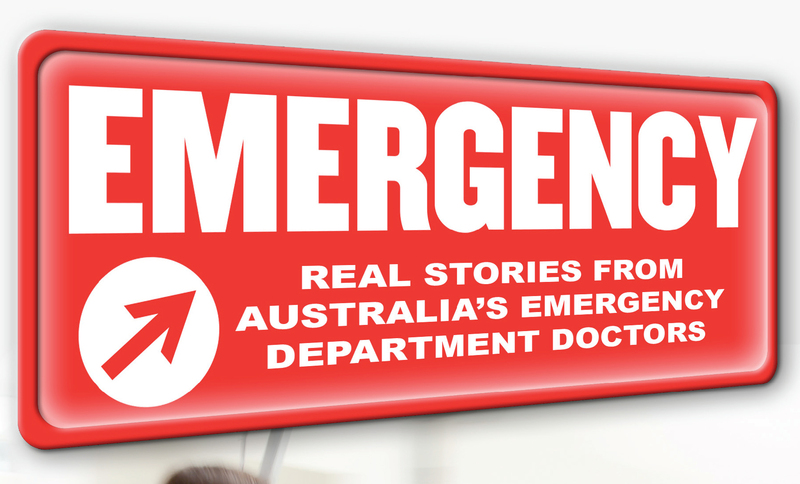 EMERGENCY: Real Stories from Australia’s ED Doctors is available now from Penguin Books Australia. Buy your copy of EMERGENCY: Real Stories from Australia’s ED Doctors today. A proportion of the profits from the book will go towards the ACEM Foundation which works towards providing better provision of emergency medicine care to the Australasian community. Dr Simon Judkins has been a doctor for over twenty years, and has worked as an Emergency Physician for fifteen of those. He has worked in Emergency Departments across Melbourne and regional Victoria, holds numerous positions with the Australasian College for Emergency Medicine and the Australian Medical Association, and is a regular contributor to public discussions on issues relating to public hospitals and public health. Amaali Lokuge is an Emergency Physician at The Royal Melbourne and Boxhill Hospitals. She has been a doctor for 12 years. She was drawn to Emergency Medicine during her internship at The Alfred hospital where she thrilled to the diversity of fast paced trauma resuscitation, the sleuth like workup of undifferentiated medical patients and the quiet chats with fast track patients needing sutures. She has always had an interest in creative writing. Her short story “Phoenix” was awarded the second prize in the Lorian Hemingway Short Story Competition 2006. Anselm Wong is an Emergency Physician and Clinical Toxicologist at the Austin Hospital and Victorian Poisons Information Centre in Melbourne. He is the Director of the Global Educational Toxicology Uniting Project (GETUP)which aims to connect countries with and without toxicology services. He is actively involved in Clinical Toxicology Research and is completing his PhD aiming to improve the management of paracetamol overdose. Anthony was born and bred in Melbourne’s eastern suburbs and went on to obtain his medical degree at Monash University. He had ‘always’ wanted to be a doctor but Year 10 work experience at Box Hill Hospital Emergency Department convinced him that emergency medicine was the ideal career. Throughout subsequent training he kept an eye out for other possible careers but none seemed to provide the variety, satisfaction or interest of emergency medicine. He subsequently found intensive care to provide variety and severity of illness so trained in that discipline. He now works as a staff specialist half time in each specialty, back at Box Hill. Anthony sees College activity as a way of fulfilling a doctor’s broad professional responsibilities and of giving something back to the specialty he loves. When not engaged in work or College activity he loves to spend time with his family, on a bike or, preferably, both. Dr David Mountain is senior lecturer in Emergency medicine, Sir Charles Gairdner Hospital Perth WA/University of WA. 27 years qualified with 24 years in Emergency mainly in Qld (5 years) and WA 19 years. His current appoitnment is 50% clinical/50% academic. Previously has been Head of the Emergency DEpt twice, president of the AMAWA, and heavily involved in hospital, national and state AMA and College organisations. He is regularly involved in representing the views of Emergency physicians and their patients in the public arena. Edward Brentnall qualified in London in 1952, and served in the RAMC in Singapore for three years. He was a rural GP in England for seven years before migrating to Australia in 1965. After another ten years of General Practice he went into a Hospital Emergency Department in 1975. He played a part in developing Triage and in the formation of the College for Emergency Medicine. He is now retired. Georgina Phillips has been working as an emergency physician In Melbourne and regional Victoria for more than ten years. Since working as a volunteer doctor in the Pacific nearly 20 years ago, she has been teaching and building capacity for emergency care in low resource environments around the Asia-Pacific region. Georgina continues to advocate for global access to safe and effective emergency care through the Australasian College for Emergency Medicine and in the wider community. Dr Joann M Gren has been an Emergency Doctor for twenty eight years. She earned her medical degree from Michigan State University in 1983, completed her emergency medicine training in Boston, and worked as a specialist in Detroit and Chicago, prior to immigrating to Australia in 2004. She is a fellow of both the American College of Emergency Physicians and the Australasian College for Emergency Physicians. In Australia, she has worked in WA and Alice Springs. Recently, she has stopped practicing medicine to devote her time to writing. Dr. Joe Rotella is an Emergency Medicine Registrar in the final year of his advanced training. He has a broad array of interests relating to Emergency Medicine including but not limited to medical leadership, communication and education. He is an active member of the Australasian College of Emergency Medicine and is looking positively towards the future. Dr Keith Edwards is an Emergency Physician who has worked in the public hospital system for over 28 years. He spent almost 15 years working at Liverpool Hospital in Sydney, one of the busiest trauma centres, where he also held the position of deputy director. For the last 8 years he has sub-specialised in pre-hospital and retrieval medicine working for NSW Ambulance on the rescue helicopter, while continuing to be an active emergency physician at Concord and Sydney Adventist Hospitals. He has a passion for education, writing, family and playing soccer. Over the years he has been involved with many committees and organisations that are committed to improving the care delivered to all emergency department patients. Dr. Kevin Ostrowski has been an emergency registrar for the better part of the last 3 years. Born and raised in Canada, he moved to Australia 8 years ago. He started his emergency training in North Queensland but has recently moved to Sydney to work at St. Vincent’s Hospital. His interests include critical care, trauma, and resuscitation. While not at work he enjoys travel, hiking, and attempting to climb mountains. Professor Mark Fitzgerald is Director of Trauma Services at The Alfred Hospital; Director of the National Trauma Research Institute; Professor, Department of Surgery, Central Clinical School, Monash University; and Professor, Faculty of Science, Engineering and Technology, Swinburne University of Technology. Professor Fitzgerald credentials include MB BS (University of Melbourne) 1981; Fellowship Australasian College for Emergency Medicine 1987; MD (Monash) 2015 (Computer Assisted Decisions Support for Trauma Resuscitation); and Global Clinical Scholar – Epidemiology and Biostatistics 2015 (Harvard Medical School). He is an Ambulance Victoria Medical Advisor, a Victorian State Trauma Committee member and the Director of the Trauma Reception & Resuscitation Project. His research themes are systems improvement, error reduction and standardisation of resuscitation care. Professor Fitzgerald has led the establishment of Trauma Systems in Sri Lanka, India, China, the Philippines and Myanmar. He has delivered 120 major presentations, 110 publications in peer reviewed journals, 10 book chapters and has achieved Au$8 million in research and development funding 2007-14. Professor Fitzgerald’s honours include the Ambulance Service Medal 2003; the Foundation Medal, Australasian College for Emergency Medicine 2003; Honorary Life Membership, Neurotrauma Society of India 2010; and the Gordon Trinca Medal for services to trauma, Royal Australasian College of Surgeons 2013. Peter Aitken is a Queensland based Emergency Physician with a special interest in disaster medicine. Apart from clinical shifts in the Emergency Department he has also worked in aeromedical retrieval services, disaster response, academic roles in universities as well as positions with government and non-government organisations. Rob Mitchell is an Emergency Medicine Registrar at the Royal Brisbane and Women’s Hospital, but has previously worked in a variety of Emergency Departments throughout regional Victoria and Queensland. In 2014 he undertook an Australian Volunteers for International Development assignment as Visiting Clinical Lecturer in Emergency Medicine at Divine Word University in Madang, Papua New Guinea. He has strong interests in global emergency care and health workforce policy, and has previously Chaired the Australian Medical Association’s Council of Doctors-in-Training. Rob holds undergraduate degrees from Monash University as well as a Master of Public Health & Tropical Medicine from James Cook University. Dr Parnis is a Consultant Emergency Physician at St Vincent’s Hospital and John Fawkner Private Hospital in Melbourne. He graduated from the University of Melbourne in 1992, and obtained his Fellowship of the Australasian College for Emergency Medicine in 2007. Dr Parnis served as the President of AMA Victoria from 2012-14, and has been a member of the AMA Federal Council since 2011. Following more than a decade in leadership roles for the profession, Dr Parnis was honoured with Fellowship of the AMA at the 2014 National Conference. Apart from his clinical responsibilities, he continues his work in medical education & public health. Within the Australasian College for Emergency Medicine, Dr Parnis has been a member of the Hospital Overcrowding Committee, and the Trainee Selection Committee. Dr Stephen Parnis was elected Federal Vice President of the Australian Medical Association in May 2014. Dr Steve Walker has been a doctor for over 25 years, and has worked as an Emergency Physician at CareFlight NSW and Nepean Hospital in western Sydney since 1995. He has served for many years on the Australasian College for Emergency Medicine Pre-hospital and Retrieval Medicine Committee. Steve has been deployed to a number of disasters in Australia and overseas, and is a member of the RAAF Specialist Reserve MCAT (Military Critical Care Aeromedical Team). His wife is an Emergency RN, and they have 2 children. Sue Ieraci has been a public hospital doctor for over thirty years, including twenty-five as an emergency medicine specialist. While holding many other roles, including management, policy-development, medical regulation and health systems consultancy, she has maintained a clinical role throughout. Sue loves working with children and old people, providing reassurance and comfort, and working alongside young doctors who are just starting their careers. She also loves language and writing – a great outlet for a high-pressure job. Venita Munir is a Melbourne based writer, editor, and emergency physician. She is enjoying a hiatus from her medical career, studying Professional Writing and Editing at RMIT University. She currently works in medical publishing and is writing her first novel. Zafar Smith is an​ Emergency Medicine registrar working at Princess Alexandra Hospital Emergency Department in Queensland. He is passionate about indigenous health and international emergency medicine in the Pacific Islands. His Samoan heritage and upbringing in Papua New Guinea inspires him to continually work towards bridging the health inequality gap that exists between indigenous and non-indigenous peoples. He currently lives in Brisbane, Australia with his wife and three young children.